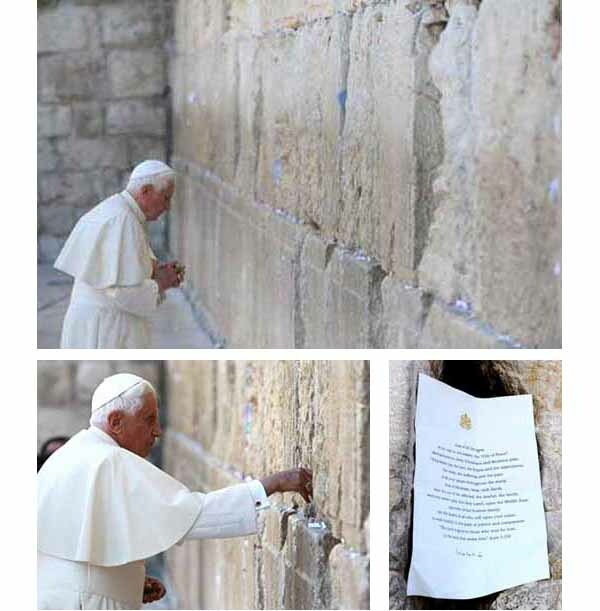 Above, one may observe a humble Benedict XVI praying like a Jew at the remnants of the Temple - the so-called Wailing Wall - on May 12, 2009. Behind him are two rabbis and two Catholic Bishops wearing white Jewish yarmulkes over their heads, as prescribed by Jewish ritual. In the pictures below, are close-ups of the same episode. As one recalls, the Temple was destroyed as part of the punishment for the crime of Deicide perpetrated by the the Jews - the high priests, scribes and Pharisees together with the people, who asked that the Blood of Jesus Christ, Son of God, fall over them and their offspring - as reported in the Gospels. After the destruction of the Temple by Titus in the year 70 A.C., one attempt was made by Emperor Julian the Apostate to rebuild that edifice. He meant to destroy the belief that the chastisement was due to the Death of Our Lord. His initiative was prevented by earthquakes and balls of fire falling from the sky that destroyed what had been made and frightened the workers. Julian died in June of 363 during that attempt to rebuild the Temple. Confessing his failure in his struggle against Jesus Christ, he cried out while dying: "Thou hast won, O Galilean!" After that, no one ever tried to rebuild that cursed edifice. Benedict XVI, like John Paul II before him, defied the wrath of God when he went to "pray" in that place - purposely ignoring the punishment of God it represents. In the prayer he wrote, the Pope depicts himself neither as a representative of Jesus Christ, whose Name he did not mention, nor as the Sovereign Pontiff of the Catholic Church, but rather as a self-appointed ambassador of "all who call upon God's name." Ignoring the Passion of Our Lord which He suffered in that very City of Jerusalem, Benedict XVI addressed the "God of Abraham, Isaac and Jacob," supposedly the same God of Catholics, Jews and Muslims. to the soul that seeks him (Lam 3:25)! 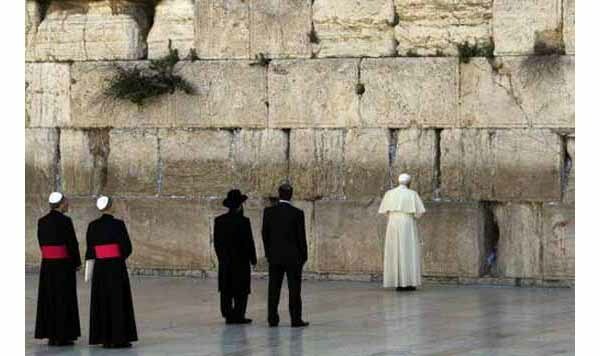 Is the Catholic Church Becoming a Branch of the Synagogue?